The hero sandwich is known by other names in different regions of the country, but it is always a large sandwich on a small bread loaf. 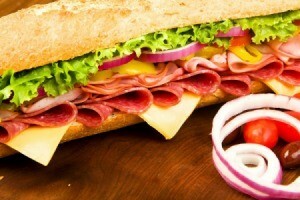 This page contains hero sandwich recipes. Preheat oven to 400 degrees F. Slice loaf of Italian bread horizontally in half. Wrap loaf in foil. Cut center part of tomato into thin slices; dice end pieces. . .
Preheat oven to 400 degrees F. Dip chicken in egg, then bread crumbs, coating well. In 9x13 inch glass baking dish, arrange chicken. Bake, uncovered, 20 minutes. Pour pasta sauce over chicken, then top with cheese. Bake an additional 10 minutes or until chicken is no longer pink. To serve, arrange chicken and sauce on rolls. You can cut this recipe in 1/2 if a smaller version is needed.